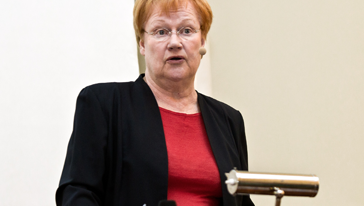 Tarja Halonen was the 11th President of Finland, serving from 2000 to 2012. The first female to hold the office, President Halonen had previously been a member of the parliament from 1979 to 2000. In addition to her political career she had a long and extensive career in trade unions and different non-governmental organizations. In 2010, Tarja Halonen was appointed co-chair of the UN Secretary-General’s High-level Panel on Global Sustainability. In 2012 she was asked to co-chair the UN High-Level Task Force for Promoting Sexual and Reproductive Health and Rights. In 2009, Forbes named her among the 100 Most Powerful Women in the world. Halonen has paid close attention to issues of human rights, democracy and civil society. Issues concerning social justice and promotion of equality have been central themes throughout her political career.